Beloveds, the Lord put it on my heart this morning that I MUST tell you this: It’s time to appeal to Heaven. We must do this now. gut-wrenching injustice; or anything else. If you’re in the United States where I am, you hopefully also have the condition of our nation, along with its upcoming election, on your heart. God, have mercy. We need mercy. We need Heaven to move on our behalf. But how does God have mercy? In response to our prayers. God moves to bring mercy and grace when we appeal to Him–when we appeal to Heaven. In the 1700s, before the United States had won its independence from Great Britain, General George Washington commissioned a flag with the words “An Appeal To Heaven,” showing a green pine tree on a white standard, to be made. General Washington ordered this flag, pictured above, to be flown atop all the colonies’ ships. The flag also flew on land in all 13 colonies. It represented the absolute dependence and desperation of the American people–desperation for God to send help from Zion. And God sent the help we needed. On time and in every way. Papa answered that appeal from our forefathers. God, have mercy. Do ‘gain, Papa. Do ‘gain. Click here to get a nylon, all-weather An Appeal To Heaven flag of your own on Amazon (affiliate link). A couple of years ago, the An Appeal To Heaven flag again came to nationwide prominence through the ministry of Dutch Sheets and others. Since that time, believers all over the world have again been hoisting this standard on their flagpoles and in their churches. We are, once again, appealing to Heaven. Beloved, I urge you to set aside extra time for prayer right now, so YOU can appeal to Heaven for your situation. I feel the weight of the Holy Spirit’s desire for us to intercede so heavily. He’s pulling me, compelling me. We in America are desperate for His help. And no matter what your situation looks like, I believe He’s compelling you into prayer too. Many of you have told me you’ve felt the weight of that call. 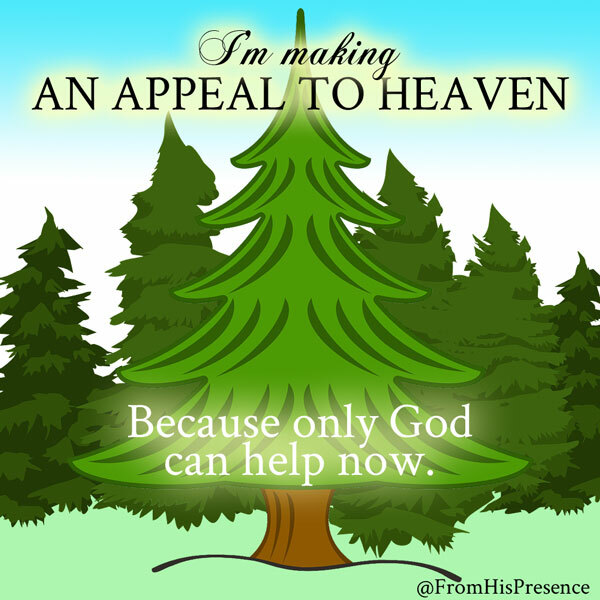 Precious Presence seekers, we must appeal to Heaven. We must pray. We must appeal to our God, the Creator of the ends of the earth, to move on our behalf. Only He can provide the help that we need. Only He can answer our call. Only He can turn around seemingly-impossible situations. Would you please join me in prayer right now, when you’re reading this, and for the weeks to come? Would you take extra time to get alone with Father and implore His help in your situation? Would you lift up His promises for help, provision, and everything else you need to Him with renewed vigor? Would you allow yourself to be desperate enough for Him that, together, we assault the throne of grace with our prayers and supplications? 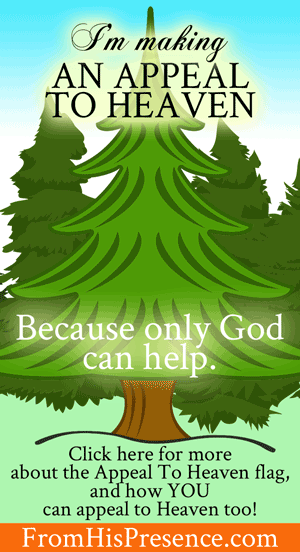 God will help, for God alone can. …if My people who are called by My name will humble themselves, and pray and seek My face, and turn from their wicked ways, then I will hear from heaven, and will forgive their sin and heal their land” (2 Chronicles 7:14). Will you join me in desperate, faith-filled prayer these next few weeks? Please leave a comment below if so! The Amazon links above are my affiliate links. That means, if you click through my link to purchase a resource on Amazon, Amazon will pay me a small commission (at no additional cost to you). 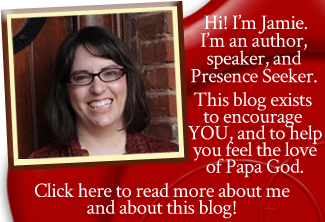 Thank you in advance for supporting my blog in this way. And if you love reading legal mumbo-jumbo, you can delight yourself in my disclosure policy here. Yes Jamie, I will absolutely join you in appealing to Heaven. Because of my personal worship, studying the Word, and your blog’s, I have been lifting up clean hands of praise and my prayers are getting answered in every area. So, absolutely, I will join you in appealing Heaven to get our collective prayers answered!!! To God’s glory and in the matchless name of Jesus!!!!!!! Thank you so much, Kahn. I was so encouraged to receive your testimony about what the Lord is doing. Thank you for sharing. He is SUCH a good Father! I feel an urgent need this morning regarding a decision about a family member, actually more. I have been in prayer. If I let go of this situation it would likely be permanent, no more contact, I felt the Lord was showing me a wildfire, if it is a Holy Spirit fire is one thing but this one I don’t think so. God bless your trip and while your their may he be reminded of our requests. Rebecca, pray and ask the Lord if that wildfire might be related to James 3:6–and a caution about this situation. That’s the verse that instantly came to mind when I read the word “wildfire” above. I am in agreement with your prayers for our country. We are here for a time like this and must stand strong in the Lord. Definitely joining you and tge others in prayer! I will definitely join you and others in prayer! My husband has been out of work for almost 2 years! He’s had both knees replaced and is in pain most of the time. He’s been denied disability twice now! I have been fretting and worrying over piling up medical and other bills. I have decided I’m not going to play the victim anymore! I’m working all I can, praying and praying…I’m believing God to come through and make good on His promises! I read what the Word says, I’m gonna start claiming it! Praying for you and all others who are struggling and for our great Country and leaders! Amen and Amen!??? Yes! Pray and decree His Word about provision and help over your family’s situation! He always answers His Word! His Word never returns to Him void, but it accomplishes the thing for which He sent it. Isaiah 55:11. I will gladly join you in prayer. I also join in to Appeal to Heaven! Cos only God can help now.. me and my famile are going through a challenging time with our settlement status and so much in justice we face.. but I still have faith. Trust and hope in God cos now He alone can help us when nobody seems to care. We definitely are praying too. Thanks for the opportunity. Remain blessed. He indeed can help. May He send help quickly as you seek His face! Yes we have to plead to our Abba Father by taking our pleas to him in heaven. This is the time for things to change to the best of our pleas. He will surely do it. Our personal agonies and that of the country we are living in all over the world. Jamie God bless you for your foresight. Yes Jamie, I’m only a bit late to the start of out appeals to Heaven, but I’m in boots and all, because only God can help my family and I now in provisions too! So much injustice (and not poor judgement) has caused so much financial distress, only God can provide, and He most assuredly will, we are appealing that now, in the year of Jubilee He will show us mercy and answer our prayers. Praying with you for your supernatural provisions for the course you want to enroll in as well as the US elections and the sensitive state of my own country, South Africa, there is much unrest here. My life is a mess, I have a divorce hearing coming up and I need prayer for restoration and provision. My future is uncertain and I need more of God and less of me. I can’t do this alone. Jesus hear my plea, I give you control, I thank you, I wait expectantly for I know you are the giver of all good things. You got my support Jamie! Posted to Facebook too. Thank you!! I obviously was meant to come to this site. The LORD has been talking to me about George Washington, for what reason, I’m not very sure. Then I see the flag he used!! After reading James 3 (recommended above), I realized that I have lived a sinful life by not trusting in the LORD’S provision. In my pride, I’ve hoarded stuff, allowed bitterness/jealousy in my heart and have put money and my job over God!!! I have been struggling with fear, a critical spirit, gossiping and have been greedy. I am supporting an out-of-work son who hasn’t found a job in three years and rarely helps me. My home and life are a mess. I also know my unbelieving son may have idols and books against God. Please pray for a breakthrough. We need a miracle!’m scared I’m going to hell! So I asked God for mercy and forgiveness for both me and my family as well as this nation and the election. At our prayer meeting today, I appealed to the LORD for this nation as Abraham appealed for the city of Sodom. May God have mercy on me!!! May God have mercy on this nation!!!! If you have chosen any suggestions for me, I’m willing to listen to your council. Thank you for listening and praying for my situation! Do you have any advice on what prayers to pray for one that is so defeated ? My daughter suffers from mental and physical afflictions, She has been a victim of severe bullying (she is a young adult now) and has zero self esteem, no friends and no direction in her life. She has pretty much given up and after losing her Dad and my husband to cancer a few years ago……defeated. I love her so much and have been praying for her to find her way for years to no avail. Is God listening? Why does He not help her? The Steps to Freedom would be so helpful in a situation like this, I believe. I will pray for you and her to have wisdom to know what to do. I need Daddy God to come through for me in every area of my life. Especially my work situation.